Here's my first manicure after chopping my nails. I've actually missed this square shape quite a bit, so it was pretty refreshing to wear it again. The bottle says it all. This is my favourite nails inc polish. It's a beautiful deep, blood red jelly. I can't get enough of it. Essie's 'St Lucia Lilac'...and a bit of gold acrylic paint. I had to put on three coats, but I still have a bit of a bald spot on my ring finger. Never mind, I still love this polish. Do you have 'Victoria'? What do you think of it? Okay, so I've finally downloaded an app which will allow me to blog (with pictures) on the go, straight from my phone. I'm really, REALLY hoping this will work, because I would prefer to blog in real time as opposed to whenever I have five minutes to off-load a backlog of posts. Another picture of a pink neon set. Whilst I know a lot of you are perfect polishers already, there are a lot of ladies who prefer to have someone polish their nails for them. Some people also prefer the convenience of press-on nails. If you think you know someone who would like a set as a gift, please visit the site and contact me. I'm rocking some nubs right now. I had a bit of a breakage mishap whilst shopping a little while ago, so I had to cull! Not a problem though - I was getting a little bit fed up of having long nails. It's nice to be able to type faster and play with the kids without worrying about goring them! My favourite base coat at the moment. I've always preferred using detailing brushes and have managed to find some that I'm comfortable with. When I was at Olympia Beauty in September, I saw some nail art pens and thought 'Pah, it's not a brush, so I don't like it'. A few weeks later I found some on Ebay and after days of mulling it over, I finally bought some. Here's what I did with them. 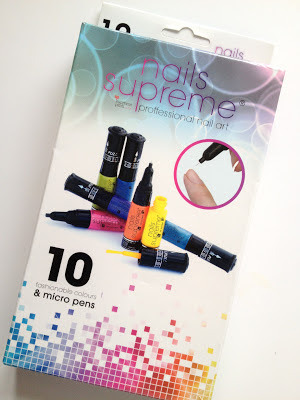 Here they are, my Nail Supreme nail art pens. £20 on Ebay. I love that you can unscrew them in the middle and organise the colours the way you want to. The flow took some getting used to. As I squeezed the pens, the varnish would sometimes spit out a big blob, right onto the nail. 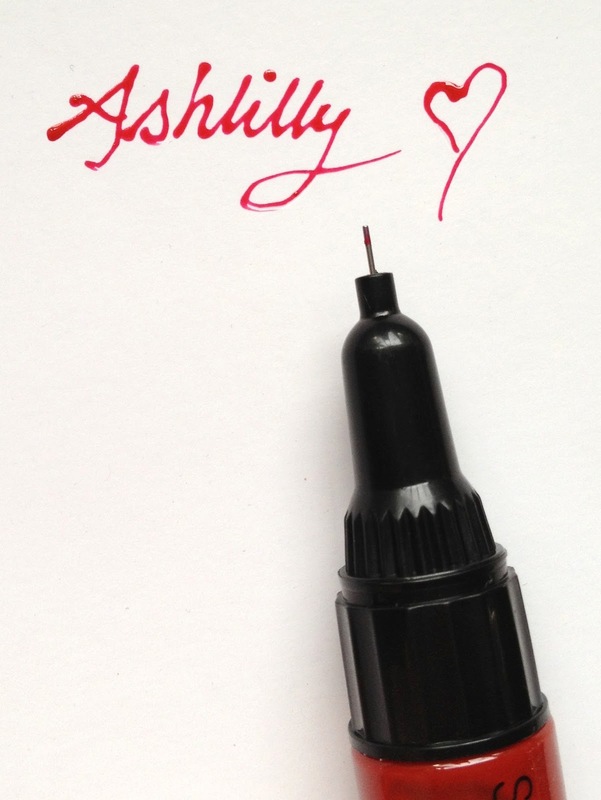 At other times, the pens flowed too much so I'd get thick lines instead of thin. I suppose it's all about practice though, isn't? The nib is a lot tinier than other pens that I've used. 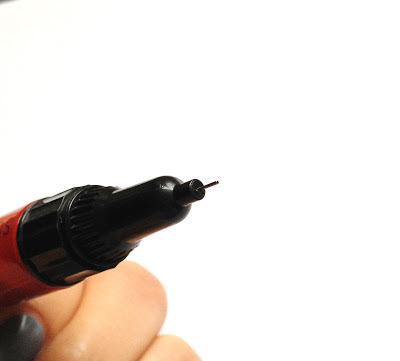 If you unscrew the black lid, you'll find a normal sized nail polish brush. I really like them...but I won't give up my detail brushes. Do you have any of these pens? What do you think of them? 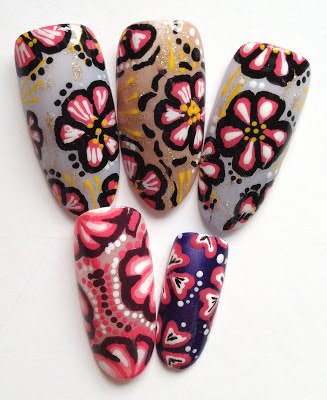 This evening my blog will be taken over by Cat and Elize from 'You Love Nails'. Every weekend these ladies dress the fingernails of both the contestants and judges of 'The X Factor' (UK) and I have to say, they do an amazing job. How happy was I when they approached me and offered to contribute to my little blog? 'You Love Nails' created a collection of cute designs for Ella Henderson’s Best of British Nails for last Saturday's X Factor. 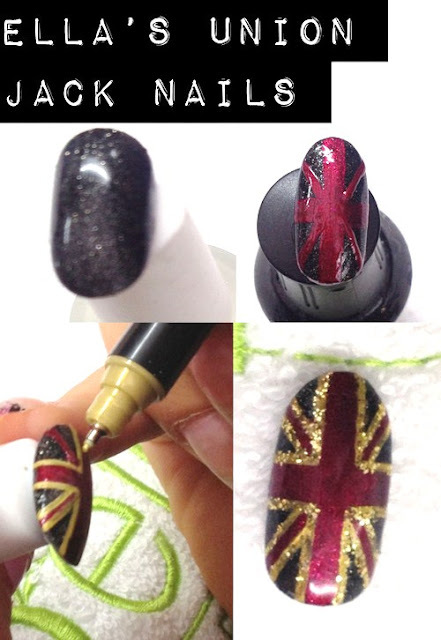 One of the favourites was the 'Union Jack' nail which is really easy to recreate at home - follow these simple steps and tag your results to @XFACTORSTYLE on Twitter - we want to see them!! 1. Cut and file the tips with rounded ends. 2. Paint each one with a navy blue, give a couple of coats for sheerer varnishes. 3. Then, paint a red vertical strip down the nail, once this is DRY paint a horizontal stripe across the nail to form a cross shape. 4. 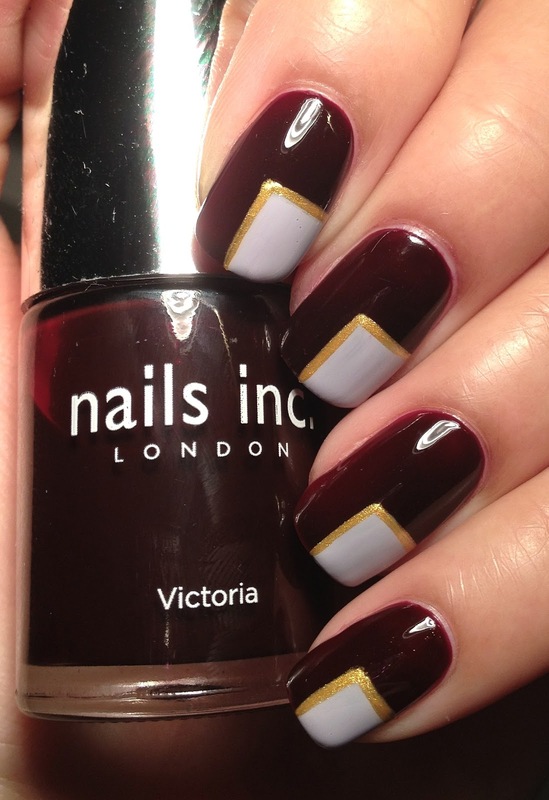 Using a gold nail pen outline the cross by painting a fine gold edge. 5. 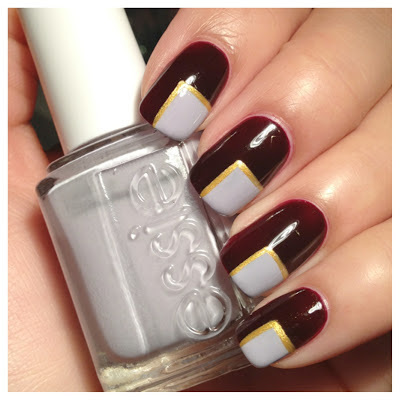 Once dry, paint EVEN FINER strips diagonally from the corners of the nail towards the centre of the cross meeting the outline you made in the previous step. 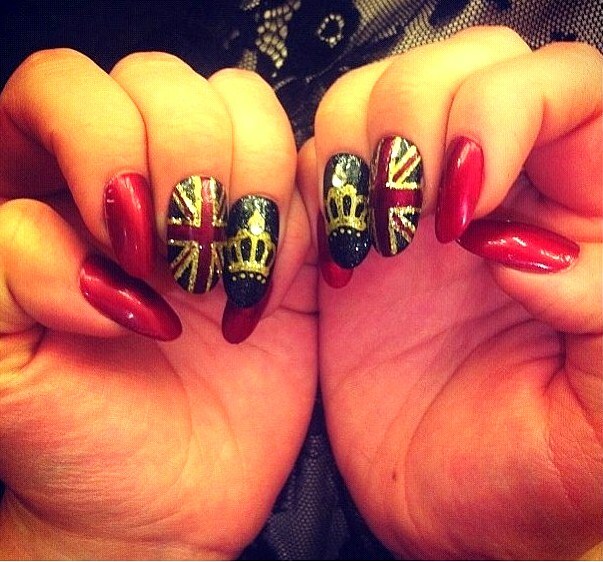 Follow Cat and Elize via @YOULOVENAILS and the X Factor style crew via @XFACTORSTYLE on Twitter. I'm really happy with today's manicure, save from the fact that my Seche Vite made a meal of it. All I know is that before I went to bed, all the cuticles were tidy and there was no shrinkage. This morning, the Seche shrank my polish away from my cuticles and my tips look they are carrying four days wear! What can I say? That'll teach me to be so heavy handed! This is Rimmel's Grey Matter. 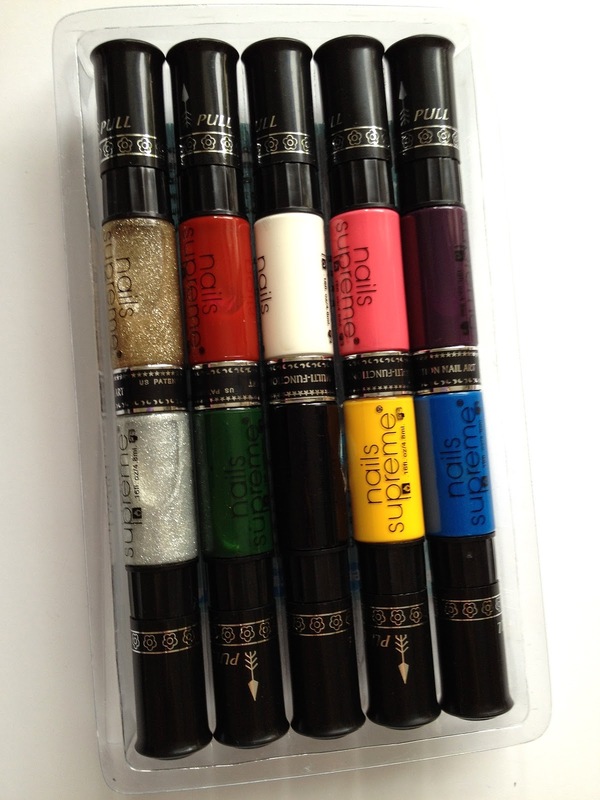 I have no ill to speak of Rimmel polishes - they do what they do and they do it well, in my opinion. Here's the rest of the crew...the only thing missing is the black acrylic paint used to outline the design. I'm afraid my point and shoot camera is really temperamental at the moment, so I've taken these pictures with my phone. The picture quality has deteriorated badly because I emailed the pictures to myself rather than downloading them directly from my phone. I should really try using my husband's Nikon, but it's too heavy for me to hold in one hand. Yes, that's my excuse. We have a tripod too...tsk, tsk. You can see the evil shrinkage around the cuticles there. Boo! 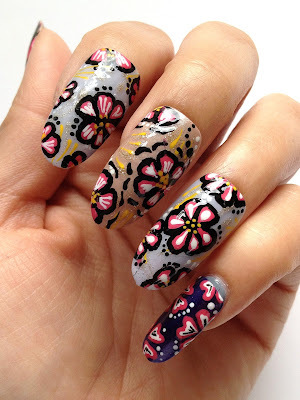 I had intended to put patterns on all of the nails, but I wasn't using my striping brush and the lines weren't coming out how I wanted them to, it was dark and it was after 1am on a school night. So, you only got two nails! I've had this gel polish for a few months now, but I've only just now got around to actually using it. The more nails I do for others, the more my own manicures are laid to waste. I'll go in with banging nails and come out with my own nail polish non-existant or smudged and adorned with lint and cotton wool! I've used two colours here: Scarlett and Burgandy. I didn't want to go with the plain ol' nails because I had a meeting with a nail bookings agent and wanted to snazz it up a little. I'm pretty annoyed though - my right hand although beautifully glossy, has chilpped already! After one day! Sooo, I guess we all know what I'm going to be doing tonight whilst watching 'X Factor', right? Thank you, as always, for sticking with me during my absences.